Vivarium 1: Scar Sites was a small project designed to influence the kind of public art projects being proposed by local artists and commissioned by the City of Kelowna. A four-day workshop was created to generate public art proposals for Knox Mountain, a beloved (and contested) iconic site in the city of Kelowna. The City of Kelowna, interested in hearing proposals for the site, co-sponsored the event and fifteen local artists were selected to take part in the workshop. 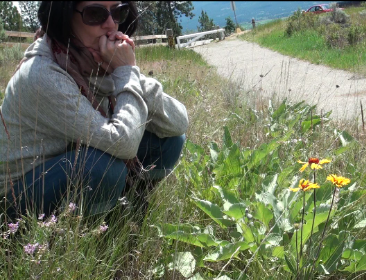 The artists participated in the four-day practicum with eco art curator and theorist, Beth Carruthers, culminating in an afternoon of presenting on-site project proposals on Kelowna’s Knox Mountain park/ recreation area. For the purposes of the workshop, we chose to focus on the theme of scar sites. This highlighted the conflict around recreational uses of Knox Mountain. Knox Mountain is a park surrounded by suburban sprawl. Contentious ideas about recreational pursuits have dominated its history: hikers are sometimes pitted against mountain bikers; beach users and water/ shoreline environmentalists bemoan high-speed motorboats, houseboats and jet-skis; dog walkers and other park users can be in conflict with wildlife. These various “uses” of the land have left scars. The project was intended, more than anything, to use art as a method for stimulating discussion amongst these various stakeholders and to generate project proposals that the city might want to commission. As critic Stephen Wright notes, problems “are the fuel of meaningful public life… formulating questions is less about eliciting responses than an act of calling a participatory public into existence” (Wright 545). through follow-up plans and events, to begin the process of developing an active group of local artists willing to participate in long-term eco art and community-based art projects throughout the region and in the City of Kelowna in particular. “Scars on the Land is really resonating with me right now. Perhaps because I have been thinking of my own body and its scars. I like that it isn’t so polarized because it has the potential to open up into real conversation and problem solving that the other issues (given socio-economic/class aspects) may not lend themselves to as easily. There is something mythic about the body and scars. There is great narrative potential – all scars have a story – what happened, how did you get this scar? So I think this scarring topic has the potential for reframing the way we (stakeholders) perceive the land. The body of the land is such a clear metaphor… Scars are also not just cosmetic. The visible scar is often the least of it; scar tissue extends around the scar and below the surface and this scar tissue can create compensations and muscle imbalances that affect the entire body. What do the scars tell us about the deeper issues around land use and our perception of land and our relationship to the place we live and play? I have this picture in my mind of mountain bikers, fitness buffs, sitting on the chosen sites and raising their shirts, pant legs, parting their hair to show their scars. It could be the beginning of a really interesting conversation about the particularly delicate skin and body of this land” (Tureski, 1). The project was funded through The Eco-Art Incubator (SSHRC), and the City of Kelowna. Tureski, Lorna. “Re: Scar Sites on the Land.” Message to project committee. 13 March. 2012. Email. Wright, Stephen. “The Delicate Essence of Artistic Collaboration.” Third Text 18.6 (2004): 533-545.